As an Advanced Flower Essence Practitioner with a lifetime using complementary therapies and alternative medicine - in the 1980's I co-founded the English Flower Essence companies 'Sun Essences' (now run and owned by my friend and co-founder Vivien Williamson) and the company 'Sun Essences for Animals'. With a passion for animals I also co-founded this company Creature Comforters® where we not only provide products for people Bach Flower Essences and the Solar Blends, but also specialise in unique products for animals - The Original Pet Blends®. ​For over 20 years I have dedicated over half of my Practitioner work to helping animals around the world. I am committed to honouring Dr Edward Bach's legacy, the man who discovered the Bach Flower Remedies, and to making his Essences in the traditional way. I feel enormously privileged to have helped so many people and animals around the world using this gentle yet powerful tool over the past 35 years. Aside from my Practitioner work my favourite activities are singing in the local choir, walking my dogs, and spending time with my 7 grandchildren and 1 great-grandchild! I hope you enjoy browsing our website. ​If you want to get in touch about anything please do. 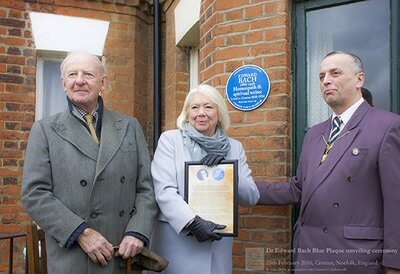 Jane unveiling a Blue Plaque for Dr Bach in Cromer. 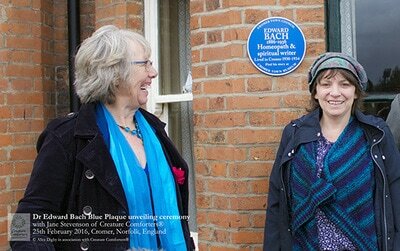 Dr Bach Blue Plaque unveling 2017 Cromer from Alice D - Riverhaze on Vimeo. Dr Edward Bach (or ‘Bark’, as some pronounce his name) lived here in Cromer from 1930 - 1934. 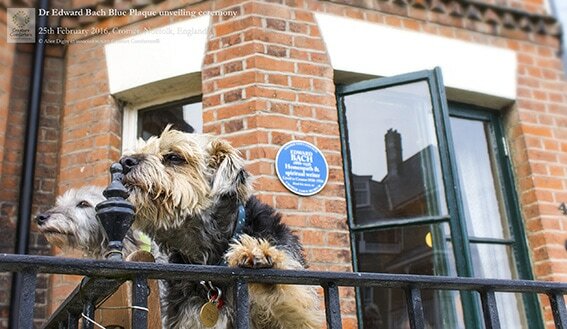 He lived in two Cromer residences: one in St Mary’s Road, the other here in this house. This was his favourite because it overlooked the sea. He was born of Welsh parentage in the Midlands in 1886. 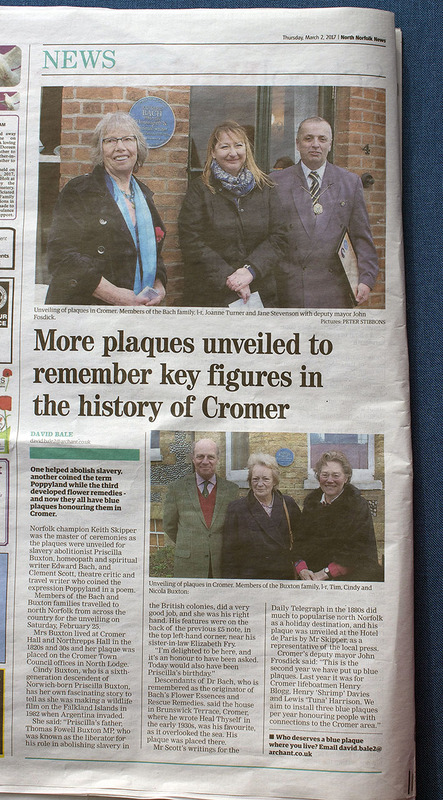 We understand that he must have visited Cromer in his earlier years as we know that he had a very great affection for this seaside town. Dr Bach was a respected medical Doctor, Homeopath and surgeon who became disheartened with some of the poor results of medicine at the time. After much observation and research he concluded that a patient’s mental state was very important to their ultimate recovery. Therefore, he set himself the challenge of finding a natural method to help make people calm and happy as, in this way, he believed it would aid a faster and more sustained recovery. Looking to his great love of nature and the outdoors he found a number of wild flowers that he felt could be used for emotional healing. Thus he developed a new method to utilize the healing properties of these flowers and created 38 gentle healing preparations - The Bach Flower Remedies. Dr Bach is famed internationally for his Flower Remedies. Many people have heard of Rescue Remedy™ – one of Dr Bach’s most popular and famous Remedies – used for helping to calm stress and anxiety. In many countries around the world the Bach Flower Remedies are now the natural medicine of choice, for treating emotional issues in people and animals, as they are gentle, effective and affordable. 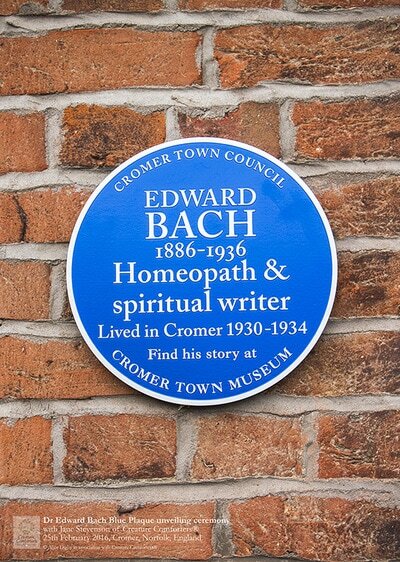 Dr Bach did much of his groundbreaking work during those 4 years that he lived here in Cromer. It’s understood at least nine, of the 38 Bach Flower Remedies, were made in the surrounding countryside, some of which he made from wild flowers growing on what is now the golf course in West Runton. From this house, where he lived, he had a good vantage point overlooking the sea and the lifeboat station. He greatly admired the bravery of the lifeboat men as they tackled the rough seas – risking their lives, saving others. On one famous occasion, in December 1933, Dr Bach witnessed the heroic rescue by the legendary Henry Blogg, and his crew, of two men who - for 2 hours - had been clinging to the wreckage of the Sepoy. Apparently Dr Bach went to his kitchen, here, and quickly blended a mixture of his Remedies. Then, as the first sailor was brought ashore, he rushed down the gangway and gave the half-drowned man some of his newly created remedy. It is said that, after taking this, the sailor made a quick recovery. as it was used in that sea rescue! In 2006 – on what would have been his 100th birthday - the Bach International Conference was held here in Cromer, at the pavilion theatre. It was attended by speakers and delegates from 32 different countries around the world. Dr Edward Bach is clearly an important figure in the history of Cromer and we are pleased to report that 87 years on, from his time in this town, his Flower Remedies remain as popular as ever. Jo and I have been working in this field for many years so it is a privilege to be asked here today to have this wonderful opportunity to honour his life and work. Jane grew up in idyllic Cornwall, England where she would take her collie dog for invigorating walks along the rugged coast where they lived, surrounded by the untamed sea and wild~ weather - Mother Nature in all her powerful magnificence. Her mother was a district nurse and midwife with sole responsibility for Cornish residents within a 20 mile radius of their cottage. She also had a keen interest in herbal remedies and alternative medicine which fired Jane's passion for natural remedies and caring for others from an early age. While studying Zoology Jane gained an insight into animal behaviour and physiology. This, combined with her childhood of observing her mother as a nurse and using natural remedies, was the ideal foundation for a lifetimes work using alternative therapies to help people and animals. 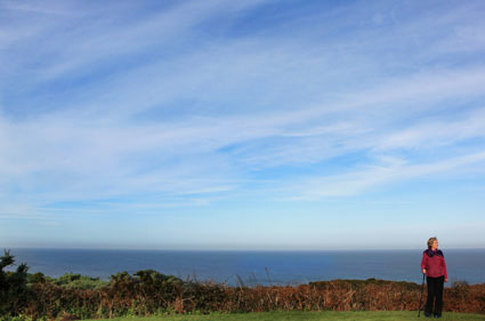 Jane's family (the Slades') provided the inspiration for acclaimed author Daphne Du Maurier's first novel 'The Loving Spirit'. This novel was inspired by Jane's great grandfather and his local ship building company in Polruan opposite Fowey harbor (Fowey pronounced Foy). And Jane was named after her great grandfather's ship that is the star of Du Maurier's book - The Jane Slade (re-named the 'Janet Coombes' in Du Maurier's novel). 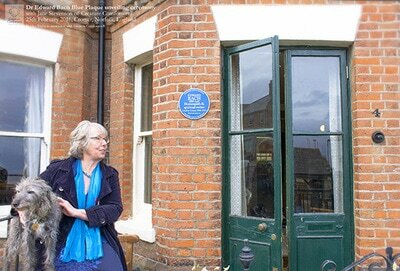 In the mid 1970s, after studying in London, Jane moved to Norfolk, England to start a family. This is where she began using the Bach Flower Remedies to help friends, family and locals. Jane was renowned for providing a shoulder to cry on, a cup of tea and some soothing words for anyone who was in need. Her kitchen was always bustling with friends, neighbours and everyone's children - the door was always open and she was christened 'Aunty Jane' to everyone who knew her! Making her own flower essences was a natural progression and so in the early 1980s, after meeting Vivien Williamson who was also knowledgeable on Dr Bach and his remedies, she decided to make her own collection with the help of Vivien. After thoroughly researching Bach's traditional methods and his original locations and plant species, she and Vivien spent several years making The Complete Set of Bach Flower Remedies in the fields and meadows of Britain and, for Bach's Olive and Vine Remedies, they traveled to Crete and Spain. During this time they also discovered several new flower essences, many of which have proven to be particularly suited to addressing emotional problems in animals, such as Bluebell. Together, with Alice Digby's help on product development and design, they built the English flower essence companies Sun Essences and Sun Essences for Animals. They also created a separate complete set of Bach Remedy Mothers Essence Tinctures using the Kosher method (Kosher Remedies now available through Jane's former company Sun Essences). This range provided the Jewish market in the USA with authentic, Kosher Bach Flower Remedies. Their company Sun Essences was also one of the first (if not the first) to produce and manufacture 'flower essence combinations', i.e. a number of essences blended together to make a composite bottle of essences especially formulated to address specific emotional conditions (e.g. for confidence, for sleep, for clarity etc). They named this range the Solar Blends. Jane was also passionate about the importance of colour within the Solar Blends and so introduced a system where there was a balanced 'rainbow of colour' within each bottle, represented by the full spectrum of flower colours. By now Jane had become a highly respected flower essence Practitioner and dowser, regularly supplying clients from all over the world with remedies to help with transient emotional problems. However, she soon realised that there were just as many animals who needed help, as there were people. Her love of flowers, affinity with animals, Zoology qualification and extensive knowledge of complementary therapies provided a solid foundation for the formation of the company Sun Essences for Animals. She and Alice latterly expanded the company to also provide her Bach Flower Remedies, which she'd been making for the previous 25 years, and essence blends for people (as well as animals). Therefore, in 2007 this required a change of company name, so that people didn't get confused, thinking we only helped animals. And so we went from being known as Sun Essences for Animals to our current name - Creature Comforters. Jane is now dedicated to helping animals: working closely with vets, trainers, animal sanctuaries and the RSPCA (The Royal Society for the Prevention of Cruelty to Animals). She also provides consultations, remedies, blends and complementary therapy advice for people (and animal owners!). She began working with the Bach Flower Remedies over 35 years ago, and has found using this pure and natural remedial method to be extremely effective and rewarding. 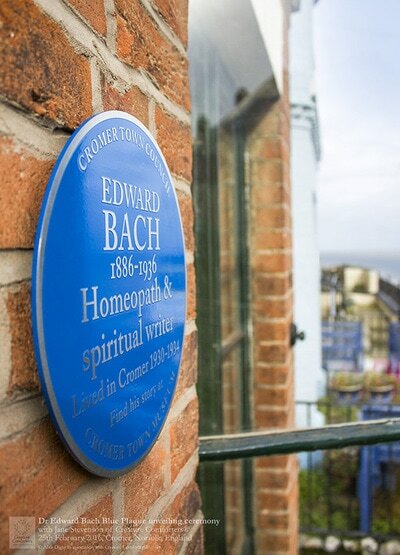 Creature Comforters is based by the English seaside town of Cromer, Norfolk, where Dr Bach (the man who discovered Flower Remedies in the 1930s) lived and worked, and Jane feels privileged to continue this important work so close to its original roots. On 25th February 2017 Jane was honoured to unveil a Blue Plaque for Dr Bach at his former home here in Cromer (watch the video here). Dr Bach felt that every household would benefit from his remedies, and Jane’s wish is that all animals also have the opportunity to benefit from flower essence therapy. Jane's current passion (nay obsession!) is her local amateur choir - 'Sing For Joy' whose repertoire includes a range of genres from African, to folk, to Gregorian chant (see video below). The choir performs the occasional charity concert in the UK and goes on 'singing holidays' in various gorgeous locations around the world. 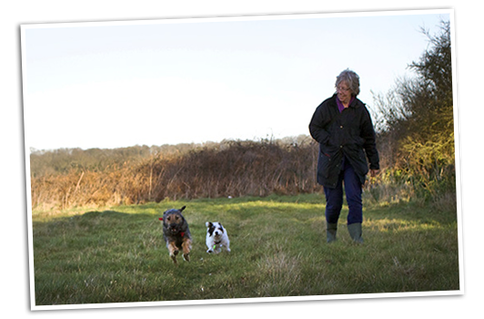 Jane has 2 daughters, 7 grandchildren, 1 great-grandchild and (currently) 2 dogs! "It never ceases to amaze me how these delicate little flowers have the power to stimulate our inbuilt healing mechanisms. I feel enormously privileged to have helped so many people and animals using this gentle, yet powerful, tool." Jane in Blickling Hall bluebell woods, with Ruby and Molly. Therefore, during the entire manufacturing process: flower collection, 'infusion' and bottling, all our products are hand-prepared with care, attention and sensitivity. We are also distinct in that we blend all our essences to a traditional stock concentration, direct from the 'Mother' tincture - precisely as stipulated by Dr Bach (the man who discovered the Flower Essences in the 1930s). This method is reported to give each remedy an extra potency. We remain resolutely faithful to Dr Edward Bach's original instructions - using the natural, time-honoured and preferable 'Solar' method of infusion where applicable. Furthermore, our Bach Flower Remedies and Flower Essences are not homeopathic. The methods and manufacture of Homeopathic medicine and Flower Essences are entirely different to each other. 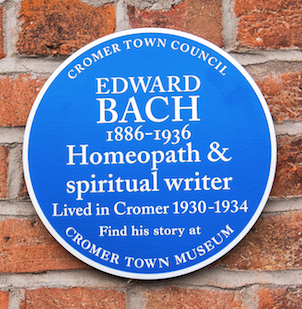 Dr Bach (the man who discovered Bach Flower Remedies) did not make his traditional Flower Essences homoeopathically. Our Essences are traditional and authentic. Creature Comforters® is a relatively small, family run, Flower Essence company, and our main focus is Flower Essences therefore, perhaps because of these two things we are able to devote the time and effort needed to make each Remedy in the traditional way - by hand, using the 'Solar' method, and to the correct concentration. We take no short cuts in the making of our Essences! Jane's local choir - Sing For Joy! Click 'play' on this video to hear Jane singing with her local amateur 'Sing for Joy' choir, run by her good friend Teresa Verney. People named my kitchen in my house 'Jane's Cafe' because it was always busy with visitors, popping round for a cup of tea and a chat (and sometimes a remedy). ​So it was only natural that I would eventually have a real 'Jane's Cafe'. 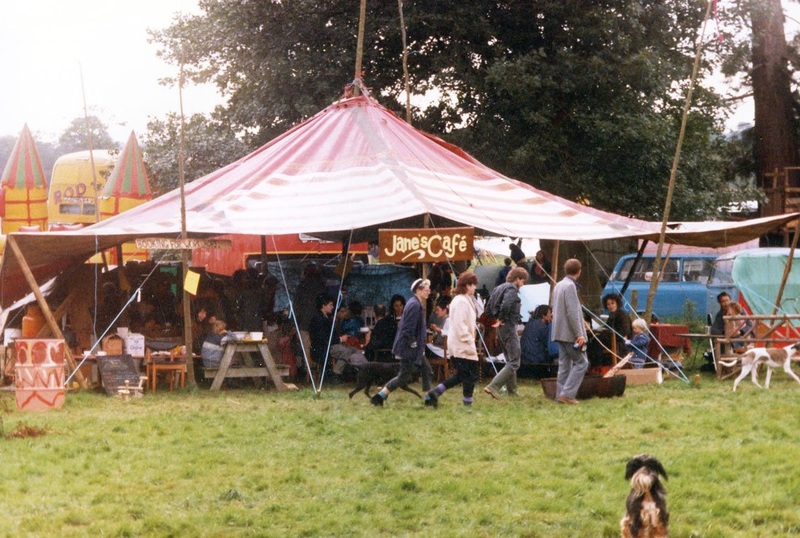 This is an old photo of my tented cafe at one of the Norfolk Albion Fairs, back in the early 1980's. I loved my Cafe and my wonderful team of helpers - happy memories! By the early 1980’s I had many years experience as a Flower Essence Practitioner and was well-used to the remarkable healing properties of the remedies when used on people. However, at that point, I had little experience of using the remedies to help animals. One day my 6 year old daughter Hannah came rushing into my kitchen shouting anxiously: “Mummy, there’s a hurt bird outside”. I rushed outside to find a robin who was motionless and barely breathing. I held the poor little bird in my hands and we both watched, helplessly, it was lifeless with its neck bent and head on one side - it looked like it had a broken neck, it was barely breathing. Hannah was really upset and I felt sad that I had no means to help the bird. Then I remembered the ‘Rescue Remedy'. It was worth a try, so I put a couple of drops onto its beak. Hannah and I waited for a couple of seconds and then watched in astonishment as the bird twitched, opened its eyes, lifted its head and went "cheep" "cheep"! So we put it in a box with some hay and gave it several more doses of Rescue Remedy over the next few hours. Hannah and her sister Tara dug up some worms from the garden. Over the next week week kept it warm in the box in our sitting room and gave it food, water and Rescue Remedy every day. Then one day, when I returned home from work, it was flying around the room. So I opened he window and, with that, it was gone! I often used to wonder if it had survived, having lost those vital days away from its natural habitat, but several weeks later, I went outside my back door into the garden, and sitting on the branches of my cherry blossom tree were two red breasted robins - looking at me. This was unusual because robins are notoriously territorial and don't often share a branch. 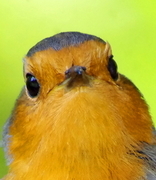 Then, quick as a flash, one of the robins jumped off the tree, went through my door into my house and 'hop' 'hop' 'hopped' down the hall and into the sitting room. It flew around the room and then hopped back along the hall, out through the door and flew away. I am convinced that was the same robin whom we nursed back to health. Magical! Living deep in the Norfolk countryside we would find injured wild animals (birds, rabbits, pheasants etc) in the fields and on the lanes. And my neighbours would bring me any injured animals they found to use my ‘magic remedy’. From that day on I would always use my version of the ‘Rescue RemedyTM’; ‘Comforter Essence’ to try to help revive these animals, and, depending on the severity of the injury, it usually worked. Remarkable! 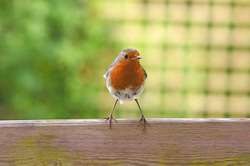 Looking back I now realise that that experience with the robin was important: it made me appreciate how powerful the remedies are for helping animals, and this inspired me to specialise in flower essence therapy for animals, and some years later I formed my own company for this purpose: Creature Comforters. I have provided thousands of individual Flower Essence Consultations for people and their pets, on a daily basis, for the past 3 decades, including for veterinary surgeons (their patients) and for the RSPCA. I have co-founded, managed and ‘worked within’ two Flower Essences companies. Tasks have varied from: making, bottling-up and selling; to teaching, writing and prescribing; to secretarial, administrational and managerial roles. As a qualified Reiki healer and Counsellor I have used these skills to help people and animals for over 25 years. From 2003 until 2011 I was a full-time carer for my disabled mother. During those eight years I gained plenty of relevant experience in caring intensively, and attentively, for those who are vulnerable and in need, in these three areas: physically, emotionally and psychologically. The experience and knowledge gained was profound as, being a carer day and night for over eight years, one acquires a comprehensive, ‘all-embracing’ insight into this area of expertise, which is incomparable with simply learning the ‘theory’ of caring, nor the intermittent ‘practice’ of the profession of caring. I also worked part-time at various private and council-run care homes, in Norfolk, in the mid 1980s. 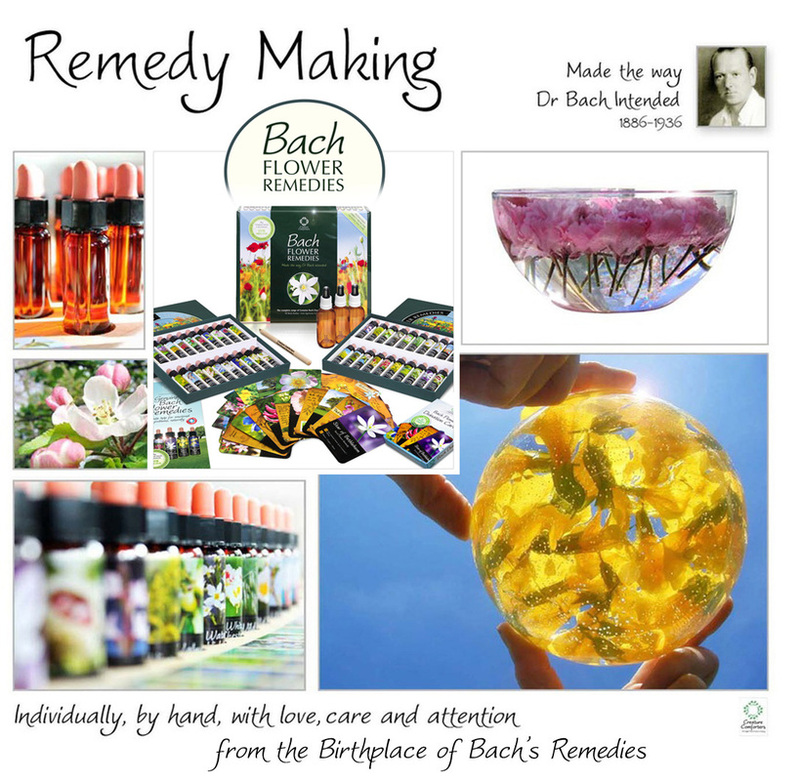 For many years I have been making Flower Remedies - to the precise instructions of Dr Bach - in various locations throughout the UK & Europe. In some years my colleagues and I have made batches of all of Bach’s 38 Remedies. In the 1990s my business partner and I made the complete Bach range as Kosher remedies (for the US market). I have written and co-authored: teaching courses; magazine articles; booklets; leaflets; brochures and publications on Flower Remedies and Flower Essences. In 2017, because of my 35 years work within the Flower Essence field, my residence in Cromer, and the number of articles I have co-written about Dr Bach's Cromer, I was asked by Cromer Town Council to unveil a Blue Plaque for Dr Bach's former residence in Brunswick Terrace.